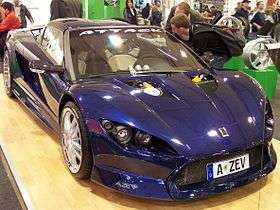 Prototype BAZ Locusta based on Škoda Garde. 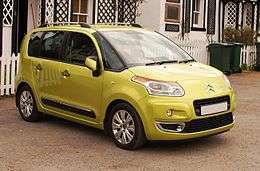 Citroën C3 Picasso is now produced in Trnava. 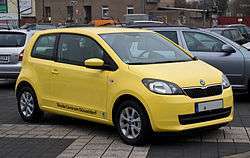 Škoda Citigo is now produced in Bratislava. Since 2007, Slovakia has been the world's largest producer of cars per capita, with a total of 571,071 cars manufactured in the 2007 alone in a country with 5 million people. With production of nearly 1 million cars in 2013, Slovakia was 18th in the list of worldwide car production by country. Automotive is the largest industry in Slovakia with a share of 12% on the Slovak GDP in 2013 which was 41% of industrial production and 26% of Slovakia's export. 80.000 people were employed in the automotive industry in 2014, which will be even increased when Jaguar Land Rover starts production in Nitra in 2018. First automobile fully constructed in Slovakia "Drndička" was made by the blacksmith Michal Majer in 1913. He copied a car of the Bulgarian King who was at that time travelling through Slovakia. After World War I (in 1918) Slovakia became a part of the newly formed Czechoslovakia. 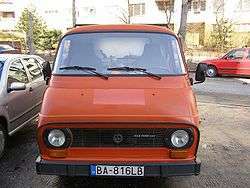 In the Czech part, the industry had been influenced mostly by Germans - see for example the dispute about the design of Tatra T97 by Hans Ledwinka vs Volkswagen Beetle design by Ferdinand Porsche, who was also born also in Bohemia (now part of the Czech Republic). Czech long tradition of car production started in 1897, when in the factory in Kopřivnice (Nesselsdorfer Wagenbaufabriksgesellschaft later Tatra) the first Czech car (Präsident) was produced, and in 1898 the first lorry. Škoda Auto (and its predecessors) is the fifth oldest company producing cars and has an unbroken history. The first Škoda motorcycle made its debut in 1899 and in 1905 the firm started manufacturing automobiles. Already before World War II, the automotive industry was a significant and advanced part of the economy of the former Czechoslovakia. Post-war socialist Czechoslovakia restored auto manufacturing with original brands and became the second (after Poland) in Soviet block outside the USSR. Brands Skoda cars and trolleybuses, Tatra and Avia trucks and trams, Karosa buses and Jawa and ČZ motorcycles were all completed in Bohemia or Moravia, but not in Slovakia. Companies in Slovakia like Matador Púchov, VSŽ Košice (steal mills) and others were supplying parts and components to Czech part of the republic but later (from 1971) the part of final production of Skoda cars was established also in Slovakia as Bratislava Automotive Works (BAZ) and Trnava Automotive Works (TAZ) and of Tatra cars in Banovce nad Bebravou. However, following the dissolution of Czechoslovakia in 1993, the Czech Republic has inherited most of its auto capabilities and since then, has grown fast through foreign investments. Although Volkswagen bought Skoda Slovak production sites in Slovakia already in 1991, it got the full control only in 1999 when Volkswagen Slovakia was established, which actually started the fast development of the auto-industry in Slovakia. Now Slovakia is one of the significant European (7th) and World's (18th) auto maker, having annual output of near 1 million and large export to more than 100 countries. Auto manufacturers in Slovakia, currently include 3 OEM automobile production plants: Volkswagen's in Bratislava, PSA Peugeot Citroën's in Trnava and Kia Motors' Žilina Plant. There are many other tier suppliers. ↑ "Najstaršia automobilka na Slovensku bola v Psiaroch (The oldest Slovak car-production facility was in Psiare)". Peter Ižold. 23 September 2010. Retrieved 19 September 2014. ↑ "Professional MBA Automotive Industry: Factory visit and workshop at PSA Peugeot Citroën in Trnava". Automotive.tuwien.ac.at. 2012-03-30. Retrieved 2012-09-29.